We track millions of social media posts and use machine learning to determine sentiment for hundreds of cryptocurrencies in real-time. Below is sentiment of tweets for Ripple over the last few days but unlike in the previous post the sentiment below are based on hourly basis not daily. We wanted to show you how much more profitable is tracking real-time sentiment than daily sentiment. If you followed the real-time sentiment and entered position on spike at 13th December 4am UTC time the return since then is even higher over +120% in around a day. 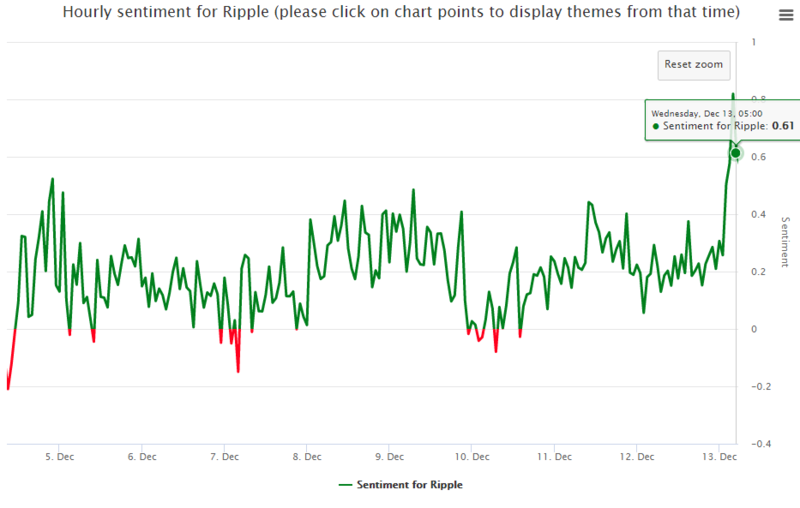 [Edit on 1.1.2018: since writing this post the rally of Ripple has continued and the return achieved since our trading call is now over 340%] Real-time sentiment is turning out as a truly outstanding trading signal. And the return is twice as high as when following daily sentiment (see our previous blog post about daily sentiment charts). You can see fascinating trading signals like this by subscribing to our platform www.bittsanalytics.com.